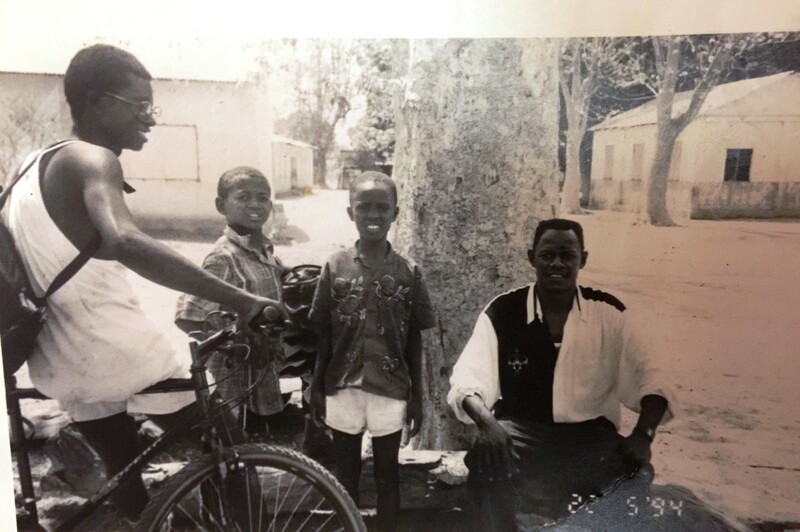 Augustine, left, with friends in from his school, was always finding mischief with other youngsters in his village. The whistle blew. Komba Bottom ran toward the ball. I knew where it was going. I stood there, and the ball came with a vehement speed. I stretched my arms and punched the ball with my two hands. My right hand then broke. The house issue had just started settling down. We were getting ready to live in our new home even though it was incomplete. My grandmother wanted us to be there, but I was not happy because the house had a lot of work yet to finish and the family’s “omole,” or moonshine, production had ceased due to the police getting wise. We were trapped and handicapped. It was not a pleasant situation for the family. My uncles, though, were anxious to return, especially Aiah James so he could have a room to bring his girls. He was well supported by his mom, “Sobba Peppeh” — my grandmother — because he was the youngest of her four children. I remember when my uncle had come from Pakidu, their home village. He was big and looked older than he was. He was not fit for an elementary school. I was in Grade 1 when he arrived. He had no skill in anything and was unwilling to learn. He was sent to a school in another town called Yengema. He was the biggest at the United Methodist Church School. But people understood his situation. My grandmother took much interest in my education, but she did not trust, at first, that I’d been assigned to the right class. The trend in the school in those days was for children to go through three levels — the A, B, C — of the first grade to enable younger children to mature before they reached Grade 2. I was quite young, younger than many if not all. I was only tall. The method of placing students could not always be done by age because some of the children had no birth certificate. My grandmother had kept mine in our iron suitcase, old fashion. Acceptance in those days was based on two factors: birth certificate, and by putting your hand over your head to try to touch your ear. If you could, then you qualified to attend school. I was a tall boy. My hands overlapped my ear, so I qualified to be part of the school. I was active and useful, but I still had to go through the A, B, C of the first class. I succeeded and made a mark in my first grade. I loved the singing, the drawing, and the spellings we did. The school was interesting. The early grades had been exciting, but I started realizing that there was a long way to go. 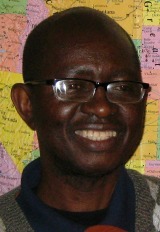 My Uncle Sahr, the eldest of the uncles, was educated. He became a Native Police officer after he abandoned pursuit of a military career. He was strong but feared the tension in the army. He returned home at night. He was a good hunter and was the best shooter. He feared the food rations. He ran away because of hunger. They ate less as recruits, which he did not like, and he felt he could not survive there. He was doing his best as a policeman. They knew he was a strong man. Sahr “Tay” James was loving. He gave me the name Daniel James. The James, after him, was my mother’s surname. I loved the name, but dad was Kanjia. Many villagers called me Tamba Daniel for a time. The name could not survive for long. The name was replaced when I was promoted to third grade. One of the many children of my late father, Mr. Henry Kanjia, noticed I was called Daniel James, went to the school and changed my name. Just like that. I liked the name just to be associated with my uncle and mother. And I liked that it was not a native name. I was then called Tamba Kanjia, meaning the second son to Pa Kanjia and Hannah, my mother. My grandmother did not know much about school issues. I was the first child she sent to school and cared for. Around holidays I sometimes missed more school than I should have. She would bring me to visit her family members and help on their farms — and to take my portion home. She would harvest the rice and give me handfuls each time to harvest more rice for us. I was lazy and feared the grass touching my body. I ended up harvesting more than I could have imagined. No one could believe it was my handiwork at the end. Harvesting rice for family members and taking some home could not pay any school fees. It made it worse for me because I ended up having scabies on my head and body, and that would take time to heal. It was painful. It was in Grade 7 we would take a national exam to qualify to enter high school. It was seven years of elementary school and five of high school. I was in the final year of elementary school preparing to enter high school. The exam was called Selective or Common Entrance, and was difficult. It determined a lot of people’s suitability for continuing their education. Many met their limitation here. My scabies was feeling better. My body was recovering from itching. My friends did not laugh any more. My grandmother attributed it to my eating a type of meat I must have been allergic to. I loved meat as a child. Our lives were busy at this stage. I was on the school soccer team and in drama society. But my time out of school was the most important. I was in one of four teams owned by one Mr. John. Whatever we did at school, my heart focused on what I would be doing after school. It was the most exciting thing above all. Well, our league had started just three days earlier. My team was among the best, and many people supported my team. But I still had to get through school first. I had many people I disturbed in class. I sang songs making fun of some big boys like Sahr Bundor, whom I called Sahr Pelleh. He was big and tall and had some stern looks, a no-nonsense type of youth. I trusted my legs to run very fast in case there was a confrontation, and indeed it was always there. Rhoda Davies was another one I disturbed. She was as small as I. We were always put together in the front row with another girl called Bernadette Johnny. The three of us fitted together, but my provocation was too much for them. I named Rhoda Davies “Bokweh,” meaning tadpole. She was soft with a rounded face. 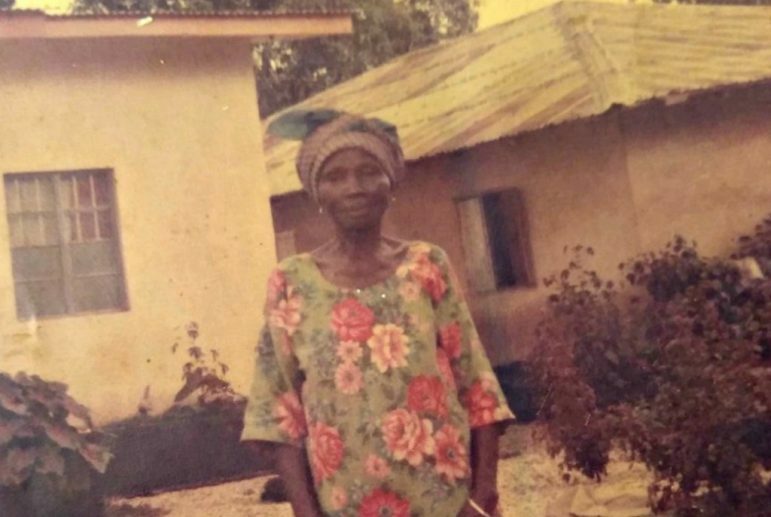 Margarette Momoh was another, who had started learning how to make cookies from my mom. I laughed at her while she was busy baking one day. She took a very hot knife and placed it on my right hand, removing my skin. I had no defense because I had provoked her. She was happy that she did that to me, and there was no way she would be punished. I became the laughingstock instead. School was great! We were being prepared to behave like matured boys. But our games were not neglected. We had the finals of our competition. It was between my team and another who were a bit older than us. I was our main scorer, with Emmanuel Gbandeh as my backup. Sahr Allieu was a good back. Sometimes I wondered who taught him to defend our team in such a mature way. He was tough at holding the position. 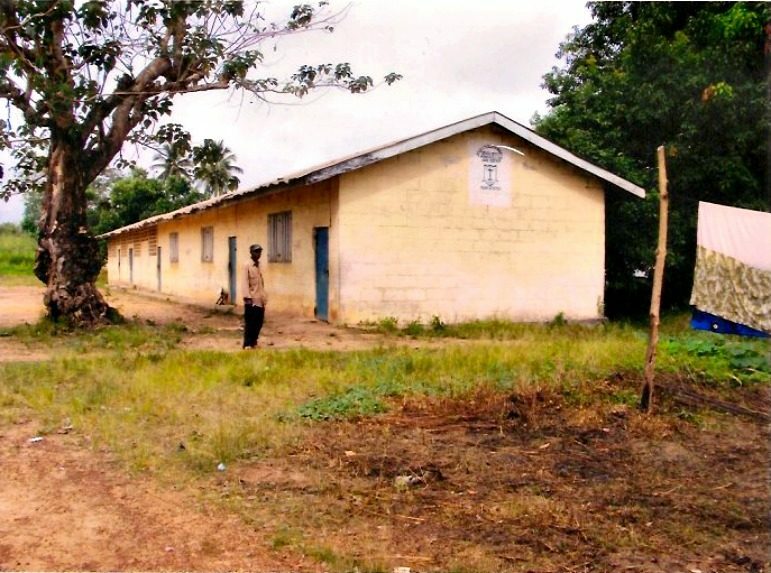 The Roman Catholic School assembly hall in Motema. The day came for the final. Mr. John had already set the lineup. I was to play the 9 (forward, striker) as usual. But my teammates were not satisfied. They knew how good I was as a goalkeeper as well. I tried playing according to what Mr. John had set already. We had a good game, but they had equalized with us. It was at the peak of competition that Mr. John relented and decided to put me in goal for the last minutes. This, he said, would enable us to defend the goal better in case we had a tie, and indeed we went into overtime and penalty shots. I saved three goals, as the spectators looked on. We were leading again. We all played on bare feet (if anyone had shoes they were supposed to keep them away to avoid embarrassing those without). We were leading by three goals. It was the fourth penalty kick round. The big boys on the other team were asked to kick their penalties this time since they were down and the game was coming to an end. Patrick Senessie, commonly known as Komba Bottom, was to take the kick. I stood very firmly waiting for his shot. Everyone advised me to be brave because he was a strong man. The whistle blew. Komba Bottom ran toward the ball. I knew where it was going. I stood there, and the ball came with a vehement speed. I stretched my arms and punched the ball with my two hands. My right hand then broke. The pain was too much. I shouted out loud, “Oh, my people, my grandmother is away and they have broken my arm!” This was said in my local dialect. This is a direct translation. I was taken away from the pitch and my hand was wrapped firmly. I cried louder each time I felt the pain. I went to the hospital and plaster of Paris was applied. We returned home. I had a little sleep. My grandmother had gone to her brother’s home to bring food for the builders. I refused going because of the games I had. She did not like it, but I had to show that I was a boy — as boys should be boys always. She came back upon hearing the news of my accident. She burst into tears and said in her crying, “I wish you had gone with me.” She was not happy. Our house was about complete. I preferred being in the house before having the fracture. Work on the house intensified, but it was not possible for me to work anymore on our new house. My uncle, Aiah Bongu, wanted me to use my left hand, which had no problems. It was impossible. But the house was almost finished and that was the good news. The bad news was, I was waiting for sneakers and a school uniform. And we were about to get into serious school business where corporal punishment was the order of the day. Indeed Grade 7 was a trap for many. Sun Spots with Hitch [Vol. 172]: Warren, McGovern and Markey -- oh my!